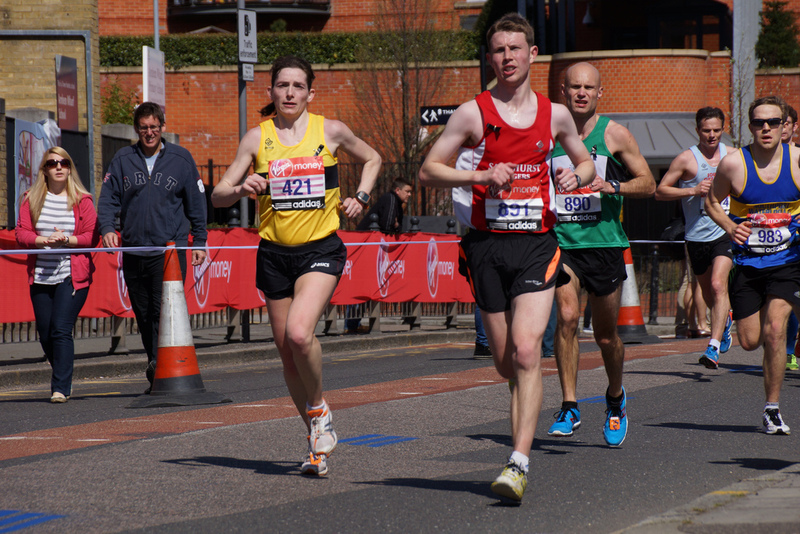 I entered Walton half marathon a few weeks ago after running Richmond Half. The aim of the day was to run it faster than Richmond and after finishing GSR in a faster time than I had anticipated I was confident that I could do this despite a very restless night’s sleep and some very bizarre dreams…I blame the clocks changing! The race started in a very low key way. There were no claxons, no count down and no giant pink Duracell bunny to warm us up which was very disappointing! I ran the first five miles with Claire (fellow SJ member) and we were running at a good pace (8.35 ish minute/miles) but I knew that I would not be able to keep the pace up for 13.1 miles and so at mile 5 I told Claire to go on without me. I then started running with another lady who seemed to be running at the same pace and I ran the rest of the race with her which definitely helped especially when I hit the inevitable mental and physical wall. We spoke about life, running, weddings, children and wine, however I forgot to ask her name! The route as advertised was very flat, the first five miles involved running the same lap twice part of which was on the road which unfortunately had not been closed for the race and therefore we had to dodge both cars and pedestrians trying to cross the road. The route then followed the two path almost to Hampton Court Palace and then back again. The tow path was quite narrow and at times we had to make room for the faster paced runners making their way towards the finish line as well as fisherman and bikes! There were three water stations along the route although water bottles were only given out at the first station and at the other two stations they only gave out small cups of water. The water station at around mile 8 was the last one and so by time I finished I was so thirsty that I was contemplating asking a stranger for water! My official time was 2.06 which was 7 minutes faster than Richmond. Once finished we collected our medals and headed back to the car park where it took us over 30 minutes to get out of the car park due to sheer weight of people trying to leave at the same time. All in all it was a very average Half Marathon, it probably won’t be on my list of must do runs next year however never say never! I may find myself back there if I’m still chasing my sub 2 hour dream as it is definitely a course that you could achieve a PB in given that it is so flat.